杜勇, 蒋少秋, 周希瑗. 重组人Slit2蛋白预处理可减轻内毒素诱导的大鼠葡萄膜炎[J]. 第三军医大学学报, 2018, 40(14): 1263-1270. DU Yong, JIANG Shaoqiu, ZHOU Xiyuan. Pretreatment with recombinant human Slit2 protein relieves endotoxin-induced uveitis in rats[J]. Journal of Third Military Medical University, 2018, 40(14): 1263-1270. [Abstract] Objective To investigate the effect of recombinant human Slit2 protein (rhSlit2) on endotoxin-induced uveitis in rats. Methods Adult SD rats were subjected to injection of 2 μL PBS or rhSlit2 (10, 30, or 100 ng/eye) into the vitreous cavity, followed 24 h later by injection of 200 μg lipopolysaccharides (LPS) into the posterior foot pads. Twenty-four hours after LPS injection, the clinical scores of the anterior chamber inflammation of the rats were assessed, and the protein concentrations and the total number of cells in the aqueous humor were determined. 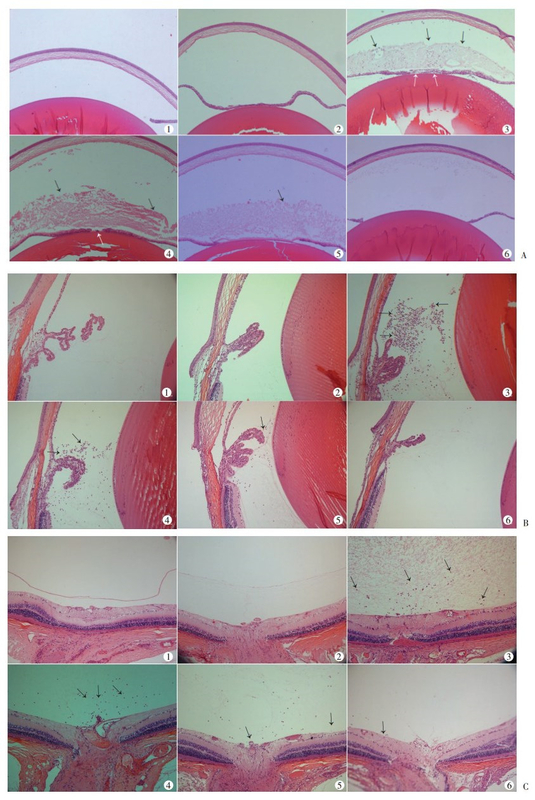 The changes in ocular morphologies were observed using HE staining 24 h after LPS injection. Real-time PCR was used to detect the expression of interleukin-6 (IL-6) and tumor necrosis factor-α (TNF-α) in the eyes, and the protein levels of IL-6, TNF-α, Akt and P-Akt were measured using Western blotting. Results Pretreatment with rhSlit2 24 h before LPS injection significantly inhibited anterior chamber inflammation in a dose-dependent manner. Compared with PBS, pretreatment with rhSlit2 at 100 ng/eye resulted in a significantly lower mean clinical score of anterior chamber inflammation (5.60±0.97 vs 1.40±0.84, P < 0.01) and protected the integrity of the ocular structure in LPS-challenged rats. Compared with those with PBS+LPS treatment, the rats pretreated with rhSlit2 (100 ng/eye) before LPS challenge exhibited a significantly lower number of intraocular inflammatory cells [(319.60±28.88)×106/mL vs (65.21±18.38)×106/mL, P < 0.01], lower protein concentrations in the aqueous humor (P < 0.01), lower mRNA levels of IL-6 (77.09±12.61 vs 19.69±5.28, P < 0.01) and TNF-α (4.06±0.58 vs 1.78±0.33, P < 0.01), and lower protein levels of IL-6 (4.42±0.11 vs 1.92±0.60, P < 0.01), TNF-α (1.69±0.21 vs 1.33±0.11, P < 0.01) and P-Akt (0.55±0.34 vs 0.18±0.37, P < 0.01) in the eye tissues. Conclusion Intravitreal injection of rhSlit2 can ameliorate the inflammation in SD rats with endotoxin-induced uveitis possibly by inhibiting the activation of the PI3K/Akt signaling pathway. 马翠萍, 金浩丽, 杨培增, 等. 伤寒杆菌内毒素诱导的SD大鼠全葡萄膜炎[J]. 中山大学学报(医学科学版), 2001, 22(6): 451–453. HOEKZEMA R, MURRAY P I, VAN HAREN M A, et al. Analysis of interleukin-6 in endotoxin-induced uveitis[J]. Invest Ophthalmol Vis Sci, 1991, 32(1): 88–95. 邱一果, 杨红霞, 杨培增, 等. 三氮脒减轻内毒素诱导性小鼠葡萄膜炎的研究[J]. 第三军医大学学报, 2013, 35(20): 2195–2198. DU Yong, JIANG Shaoqiu, ZHOU Xiyuan.